Neighbors have been fighting the redevelopment of this corner along 16th Street NW for over three years. Image by Jeb Stenhouse. Recently a group of neighbors along 16th Street NW, many from a gated community called Beekman Place, applied to downzone an area near Meridian Hill (Malcolm X) Park in order to stop a nine-story building from being built — despite the fact that the buildings across the street are almost the same height. This is just this group’s latest attempt to stop new neighbors from coming to the neighborhood in what has been a three-year-long battle so far over the project. It’s important to understand what they are doing because their strategy might become more common in development battles across DC. The proposed new apartment building would replace a tree-lined parking lot that separates the historic White-Meyer mansion from 16th Street NW. The non-profit Meridian International Center is the current owner of the parking lot and mansion, and is working in partnership with the developer Westbrook Partners. Part of the ongoing revenue from the development will go the restoration and maintenance of the adjacent mansion. The current proposal includes 110 new apartments, underground parking, and some office space facing 16th Street NW, which is one of the top bus corridors in the region and is about to get some bus lanes. It’s a great area for higher density, and the site is already surrounded by tall buildings. Just across the street, the Envoy (which, coincidentally is a good example of how yesterday’s ultra-luxury units eventually become a bit more affordable), is also a mid-rise structure (of seven stories) with more than 300 apartment units. Aerial of the site. Image by Google Maps used with permission. “(2) the inclusion of deeply affordable housing”: They say that because the building doesn’t include any deeply affordable housing (affordable to people making at or below 30% of Area Median Income (AMI), which is about $35,000 per year for a family of four), it should not be built. “(3) input from the community and Advisory Neighborhood Commission (ANC) be properly addressed”: Local ANC 1C has consistently voted against this project at nearly every stage of the process. The wall along Belmont Street NW. Image by Jeb Stenhouse. This is actually the second proposal to redevelopment this parking lot — the first was scrapped voluntarily by the developer in 2014. That first proposal would have been 10 stories high and had 25% more density than what is proposed now. Because that would have exceeded what is allowable under current zoning, this proposal would have triggered the Planned Unit Development (PUD) process, which essentially allows a developer to build bigger in exchange for a set of compensating community benefits (such as infrastructure improvements, additional affordable housing, etc.) that are worked out in tandem with the community, in particular with the ANC. However, after the November 2014 ANC elections, the non-profit and development team decided that it was unlikely that the PUD process would be successful. They completely redid their plans and decided to pursue a smaller project that was by-right, meaning it fit under what current zoning allowed. Among those elected to ANC 1C that November was chair Jon Marc Buffa, who also was the president of the Beekman Place Condo Association. So in 2015, the development team and non-profit proposed their revamped project with 140 homes, but they immediately hit resistance from neighbors and ANC 1C. The area is within the Meridian Hill Historic District and needed approval from the Historic Preservation Review Board (HPRB). The ANC passed a resolution in early 2015 denouncing the project as “incompatible with the historic nature and character of the Meridian Hill Historic District,” and asked “for a significant reduction in height” as well as some other design changes. This is curious, because this particular historic district is made up of many high-density buildings. That is in fact part of the history of the neighborhood; many of the buildings were famous for the high-rise luxury living they provided next to the Meridian Hill (Malcolm X) Park, forming a “prestigious enclave”. Nonetheless, by late 2016 the development team had changed their plans and presented a smaller version (110 homes) to the HRPB. In July of 2017 the HPRB approved the designs, despite two years of residents “blast[ing] proposals from the development team.” Preservation leaders in the city approved of the decision. Rebecca Miller, Executive Director of the DC Preservation League, reportedly got “some pretty nasty phone calls” after she testified in favor of final designs. This decision meant the building moved onto zoning review. Most of the project fits the current zoning for the site (RA-4), but a section of the proposal crossed into a less dense zone (RA-2), so the team applied for an exemption. The Board of Zoning Adjustment approved this request in July of 2018, though the process again was hotly contested by neighbors and ANC 1C. Normally that would mean this project is free and clear, but this month Keep Meridian Hill Green officially applied for a zoning map change, arguing that the entire site really should be RA-2, therefore the project is “out of character” with the neighborhood. If its zoning map amendment is approved by the Zoning Commission, it will be back to the drawing board for any attempt to develop this parking lot into something that can actually house people. The parking lot to be redeveloped is on the eastern edge of the graphic. Image by DC Office of Planning. The specifics of their argument are important because it involves interpreting the DC Comprehensive Plan, which has been under a lot of legal scrutiny in the last two years and used in a number of high profile development debates and lawsuits. I’ll dig into that argument and some of their others in subsequent posts. Outside of these formal preservation and zoning processes, over the years neighbors have been directly engaging with the developer and recently finalized a series of memoranda of understandings (MOUs). MOUs are not uncommon when it comes to larger development sites — they might spell out rules and regulations for how the construction will proceed, for example. These MOUs, however are unique in their intensity and the process in which they were created. After the proposal was approved by the HPRB, the development team began weekly meetings with community leaders to negotiate the terms of the MOUs. After over eight months of discussions and negotiations, the final MOUs list 120 different concerns that the developer and Meridian Hill International Center must mitigate and address, or else face a series of fines. Most of these 120 issues deal with traffic and construction related items. Others place restrictions on events the Meridian Hill Center can host, governing things like when they can host events and how many people can be invited. Representatives from multiple nearby neighborhood associations signed onto these, including the Beekman Place Condo Association, which signed last after securing a particular cut-through lane on the site they had been holding out for. It came as a bit of surprise then when Fox Perry and a few others from Beekman Place continued to vociferously fight the BZA proceedings and judgement. They filed numerous attempts to reopen and delay the case ruling, and even reached out the Ward 1 Councilmember Brianne Nadeau to intervene. It was after all of this that Keep Meridian Hill Green appeared with their public petition. Some of the arguments in the petition have been made before, but the Comp Plan and affordable housing angles are new and have not been central to any of the years of discussion that have previously taken place. Rendering of proposed project. Image by Perkins Eastman used with permission. 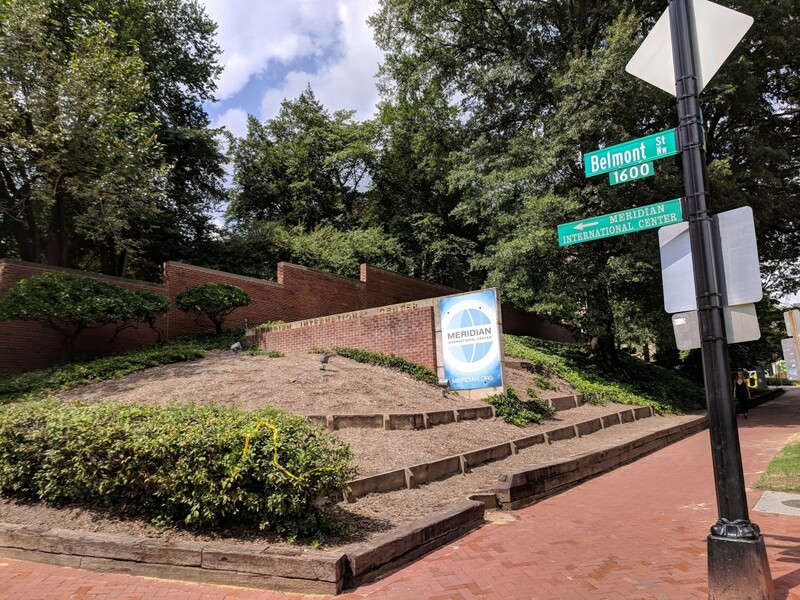 The Zoning Commission has yet to set down a date for a hearing on Keep Meridian Hill Green's proposed zoning amendment, and they might not decide to hold one. It’s up to the Office of Planning to decide if the case should receive a hearing or not. If they are given a hearing, then the Zoning Commission’s decision to keep the current zoning or to downzone the parcel will be the latest chapter of this long ordeal. If the downzoning takes place, the building will lose at least an additional two floors and the developer and Meridian International Center will have to restart the planning process entirely. To put that in perspective, the development team points out that two floors would mean about a loss of about 16 apartments, and with the parking ratios of the building, that's about 10 less cars in the neighborhood. That’s the “overwhelming” future opponents are trying to stop. This kind of exclusionary land use activism is not new in wealthier neighborhoods, but this particular case is an important one because it’s a microcosm of many of the salient development debates and legal questions the entire city is facing today. What is more, the opposing group is loudly claiming that part of their opposition is about not building enough affordable housing at the site — even while they delay and attempt to shrink the building itself. We need to take a particularly close look at what is being said and done here. I’ll dig more deeply into all of these issues in upcoming posts. ANC 1C’s next monthly meeting is September 5 at 7pm, and this case is again on the agenda. If you would like to come out to listen or to make your opinions heard, the meeting information is below. Please email me to let me know you are coming: dwhitehead@ggwash.org. This post has been updated to reflect that while the Meridian International Center does not pay taxes as a nonprofit, a representative says it is selling the land and its new building to the developer, and therefore the new building will pay taxes.